Organizations succeed or fail based on the quality of their leaders. Even in the technology soaked 21st century, leaders are still the key element in the accomplishment of your mission. LEADERSHIP IN THE SHADOWS describes in detail a set of leadership principles which have been proven in the most challenging conditions America has faced over the last two decades. 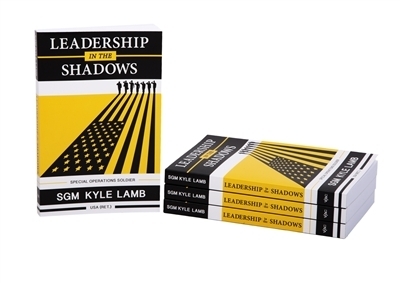 The author, Kyle Lamb, honed his leadership skills in the Special Operations community for more than twenty years. He brings you leadership lessons to draw on based on his real life experiences in one critical assignment to another. If you are in the corporate world, the military, or law enforcement, LEADERSHIP IN THE SHADOWS will help guide you to mission success. And at $24.95...what a bargain.